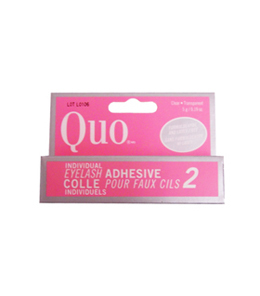 Quo brand false eyelashes glue. For individual eyelash or strip lashes. Formaldehyde and Latex free. Ingredients are isopropyl alcohol, acrylate copolymer, denatured alcohol, water, triethanolamine, PEG-400 and methyl paraben. Product of Canada.